Whether it’s a fancy adult dinner party or colorful children’s birthday bash, there’s always that one person who greets every party guest with smiles, hospitality and warmth: the hostess! The hostess is usually in charge of setting up the event, making sure there’s an abundant amount of appetizers and drinks, cooking, entertaining, meeting and greeting guests and more. When wearing many hats to ensure the success of the party and each guest’s enjoyment, a hostess’ duty can be stressful and tiring. Showing your appreciation for the hostess’ hard work will give her a little brightness in the midst of her chaotic responsibilities. Find the perfect hostess gift to give at your next event with any of these fantastic and unique products from indie sellers! 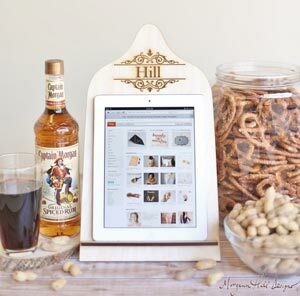 Present a handy iPad stand to your favorite hostess from Morgann Hills Designs! This iPad stand is made from a cutting board and can be personalized with a last name. With this iPad stand, any hostess can watch their favorite shows while making appetizers for her guests or view recipes easily as she cooks meals. Designed with a vintage-like pattern, this fanciful cutting board iPad stand makes for a fantastic addition to any home decor. 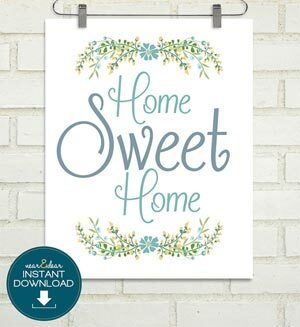 Every hostess possesses the power to make every one of her guests feel welcomed in her home, so why not present her this Home Sweet Home art print from Near And Dear Designs! This touching and whimsy art print is downloadable and printable so that you can choose the best frame to put this print in to make the perfect hostess gift. Decorated with lovely plants and used with an elegant font, this art print is a wonderful piece to put up near an entryway, office, kitchen or bedroom. 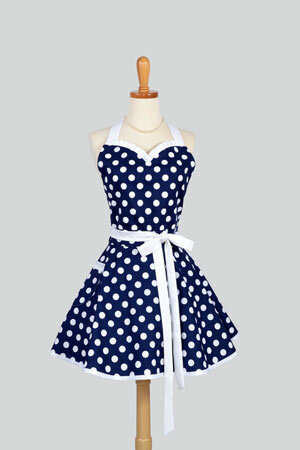 Most hostesses are known to be fabulous cooks, so give the hostess in your life Creative Chics’ navy blue & white polka dot apron! This retro apron almost looks like a beautiful, summer dress, so your favorite hostess will still look her best even while cooking away in the kitchen. With a sweetheart neckline and 1950s-inspired, flared skirt, this apron is a trendy and feminine apron that’ll make any hostess feel like a lady. Creative Chics also has many other aprons in various colors and designs to give you more apron options. 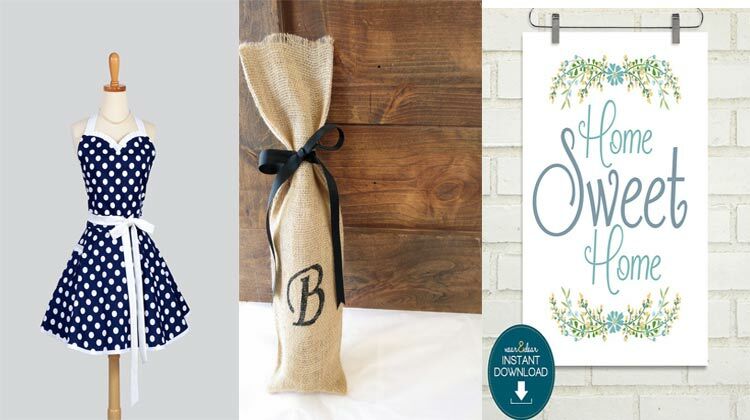 Wine is a popular hostess gift, and, if you’re thinking about giving the best wine to the hostess at your next event, wrap the wine bottle up in Gripping Glamour’s customized burlap wine gift bag! 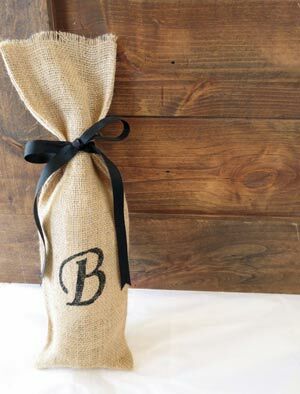 Made from burlap, this rustic yet elegant wine gift bag can be customized with your choice of initials and includes a black ribbon to secure the wine in this bag. Not only is the wine bottle a gift for the hostess, but this bag is also a gift since the hostess can use it for many occasions, from a storage bag for undergarments while traveling to a lunch bag for work. 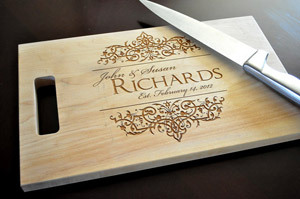 Add a touch of elegance to any hostess’ cooking with MRC Wood Products’ personalized cutting board! Customized with any family name you want and engraved with intricately detailed, swirly designs, this cutting board is a wonderful piece to add to any kitchen and make cooking a little more special. You can find more cutting boards in various styles and wood colors in MRC Wood Products’ shop! Get your hostess a cheesy gift with Urban Cheesecraft’s DIY cheese it! 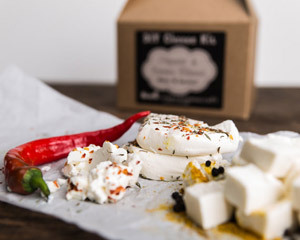 This kit includes the necessary ingredients to make Paneer and Queso Blanco cheese, and it only takes an hour to make these fresh cheeses. Any hostess can whip these up right away and serve it to her guests as an appetizer. This DIY kit makes 10 batches of cheese, which gives you more than enough to experiment with various herbs and seasonings to find the best combination for these cheeses. While your hostess serves you refreshments and hospitality, serve her with a new set of bowls from Ross Lab! From Ross Lab’s collection, “Love Is In The Air,” this dainty set of ceramic bowls are decorated with hearts in various colors, such as coral and navy blue, for a subtle yet romantic design. 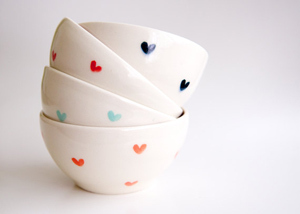 The inside of these bowls are painted according to the color of the hearts on each bowl. Ross Lab also has many other ceramic housewares for you to choose from! When it comes to preparing a home for house guests, hostesses always want to put their best foot forward in regards to home decor, so help them out with Kitsch And Fancy’s rainbow sampler soap set! Made into adorable little squares, these goat soaps are the perfect guest soaps for bathrooms in a hostess’ home. 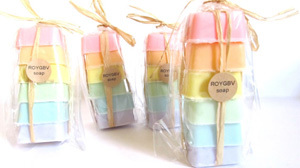 From light pink to periwinkle, this pastel-colored, rainbow soap set is a cheerful and wonderful hostess gift. Each bar has its own special scent. With the stresses of being a hostess, from the cooking to the entertaining, take your favorite hostess to a mini beach retreat with Beach Cottage’s terrarium! 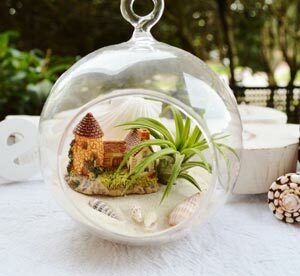 With small shells, a refreshing air plant and a quaint beach cottage, this terrarium is filled with beach-y aspects for a true beach getaway right in one’s home. You can choose from three different beach cottages for this terrarium along with your choice of sand color. Since this terrarium is shaped like a globe and comes with a hanging feature, the gift recipient can hang it near a window or porch as a home decoration. Discover more decorative terrariums in Beach Cottage’s shop. 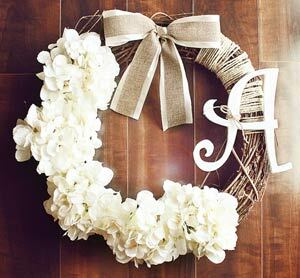 Charm any hostess’ home with Chic Wreath’s monogrammed, white hydrangea covered wreath! This simple yet elegant grapevine wreath presents white hydrangeas, a brown and white lined bow and a hand-painted, wooden initial monogram. Customize this wreath by choosing which initial you would like for the monogram and what font you’d like the monogram in. Chic Wreath also offers many wreaths in other designs and colors. Sometimes, one simple gift isn’t enough to show your gratitude for a hostess’ generosity and hospitality. If you want to give a more elaborate gift to a hostess, you can combine several of these items on our guide in a large gift basket. For example, you can add the DIY cheese kit from Urban Cheesecraft, the rainbow sampler soap set from Kitsch And Fancy and the personalized cutting board from MRC Wood Products in a gift basket along with gourmet chocolate, flowers and a goody bag of sugar cookies. With a hostess gift basket, you can get creative with it and mix and match as many gifts as you’d like in order to make the hostess gift extra special.